100 percent of every rider-raised dollar goes directly to Dana-Farber Cancer Institute. The 2019 goal is $58 million. When you register for the PMC, you are signing up for a fundraising mission first, and a bike ride second. Commit, you’ll figure it out. You’ll have plenty of help along the way. Be a part of the PMC. A Virtual Rider is someone who supports the PMC’s mission by fundraising. Virtual Riders have no fundraising commitment and have access to all PMC fundraising tools. As a Virtual Rider, you can ride your own long-distance route, log miles over time, or never get on a bike. 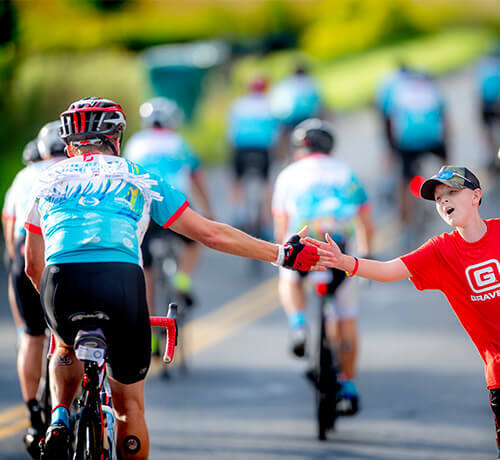 As a Virtual Rider, you make a difference because you are committed to raising funds to cure cancer. I, for myself and on behalf of my heirs, assigns, personal representatives and next of kin, HEREBY RELEASE, INDEMNIFY, AND HOLD HARMLESS PAN-MASSACHUSETTS CHALLENGE, INC., operator of the PMC, its officers, officials, directors, agents and/or employees, other participants, volunteers, sponsoring agencies, sponsors, advertisers, and, if applicable, owners and lessors of premises and/or vehicles, property and/or equipment used to conduct the event (together, the "Releasees"), WITH RESPECT TO ANY AND ALL INJURY, DISABILITY, DEATH, OR LOSS, OR DAMAGE to person or property, WHETHER ARISING FROM THE NEGLIGENCE OF THE RELEASEES OR OTHERWISE, to the fullest extent permitted by law. I HAVE READ THIS REGISTRATION FORM, INCLUDING THE RELEASE OF LIABILITY AND ASSUMPTION OF RISK PROVISIONS CONTAINED HEREIN, I FULLY UNDERSTAND ITS TERMS, AND I UNDERSTAND THAT I WILL BE GIVING UP SUBSTANTIAL RIGHTS BY SIGNING IT. NEVERTHELESS, I SIGN THE FORM FREELY AND VOLUNTARILY WITHOUT ANY INDUCEMENT.